I have been feeling so lethargic-for so long. I don't write posts, because I have nothing to post about. But it's not really true. All summer, I have been whittling away some yarns—and I have reached completion. First—a lovely blue blend of cotton and acrylic—Lion Brand's Shawl in a Ball. I turned it into a prettly little scarf—a version of Lucy Neatby's Sea Lettuce. A version because it is not quite her pattern, (which I have knit before) I was too lazy to look up the pattern proper, I just make shifted and stumbled through. But the idea, and the basic design is Her's, not mine! I love this little scarf . At its core, it is just 36 inches long, and about 15 inches wide. The ruffled drop adds another 15 inches or so to the length—making is about 45 inches long. It is soft and warm, and will go well with any number of demin things. Pretty, but not to fancy for every day wear. The color name is Healing Teal--but to me, it is shades of denim. 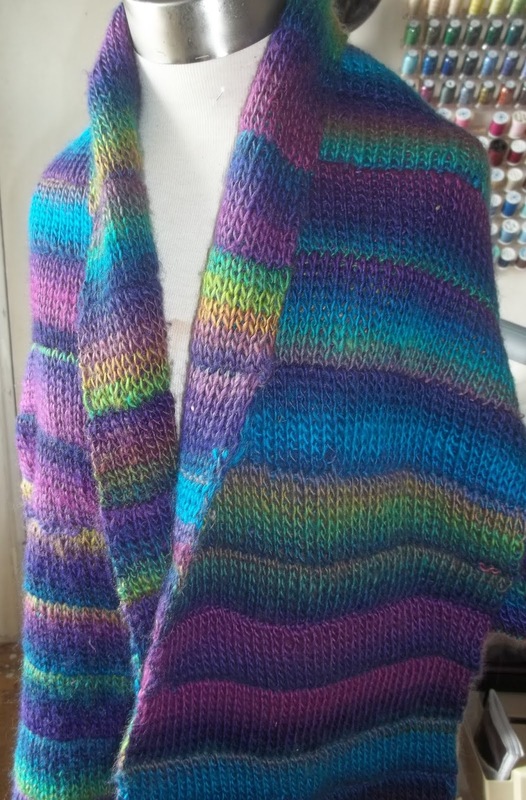 I like this yarn so much, I am planning on making a design of my ow--(but in the same family as sea silk--(that is a scarf/shawl with ruffled edges. I already have 2 more balls of this yarn in a silvery grey--(Om Opal) 2 balls because the next version will be bigger--more shawl like. (and will have a more arced shape. 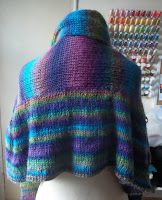 Second—a Tilted T shawl. This is a Red Heart yarn, Unforgetable. It's a lot warmer than the little blue lettuce, & its 100% acrylic—Making it easy care (machine washable) . First off, it is double knit, so there are 2 layers through out. Second, it is a less organized pattern. I tend to like large rectangular shawl. I wear shawls when I am cold, (and I feel cold so much more often these days!) I want a shawl that covers my upper back, and my shoulders, and my arms. There are hundreds of pattern for light lacy shawl.. but I want more of blanket shawl! Problem is, it is boring to knit large dense shawls! I started with a simple scarf—about 14 inches wide. When it was long enough, it wasn't wide enough. So I picked up stitches, along the center of the length, and started down. Then I decided , I didn't pick up enough stitches, and added a stitch or two for a few rows. 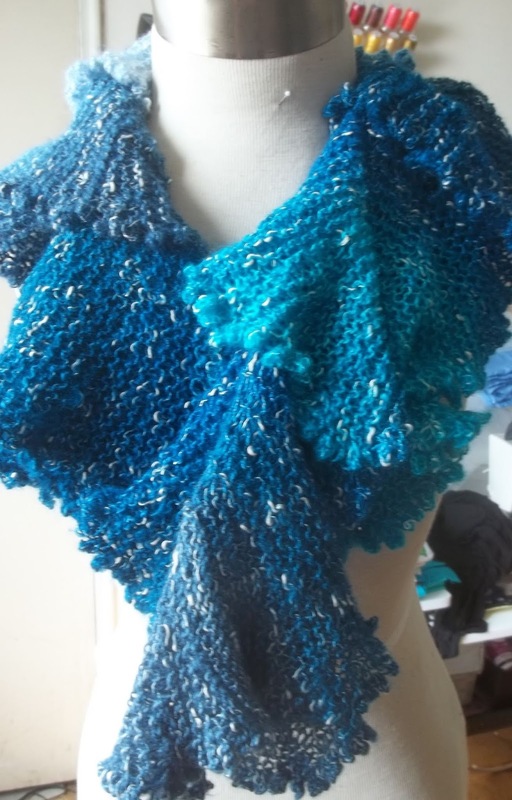 The picked up stitches curved the scarf—and made the Top of the T into an arc. But it works for me. It covers my neck and shoulders, and my upper back and wraps around my arms-- The back is not so long that I have to worry about sitting on it. It's simple and pretty and warm.. And while the days are still warm and sunny, evenings have become chilly-- So it is finished just in time. Having finished those to projects, I am now once again working on my pretty pink cardigan--which will be a good match to both the bubble gum pink skirt and the claret skirts I made in the spring. But thinking about it, I can also wear it with black and grey, and other solids skirts. This weekend I made 1.5+ Qts of Chutney—Quince Chutney! Quince are not a common fruit, and even in my multi ethnic neighborhood, hard to find—Fresh date, fresh almonds (with their peach like fuzz), several varieties of figs can all be found locally (seasonally). Even several varieties of Persimmons, (not just Fuji's) but Quince? I got my quince (with permission!) as wind fall The Queens Botanical garden has a wild quince tree. Quince are an odd fruit—Some compare their shape to a pear, but I think they are almost lemon shaped—or perhaps mango shaped. As for size, bigger than a big lemon, but not a big as a large mango (maybe about the size of small mango) Rounder than a mango, with a lovely gold tone, and sweet fruity smell. The fruit is not edible raw. It is at once, rock hard (cutting the fruit was a real chore!) and yet spongy in texture. They turn pink (not brown) as they oxidize (and they did oxidize a bit.) It took longer to cut the fruit up than it did to cook them. (Well partly because I cooked the chutney in an Instant Pot)But seriously, it took over an hour to peal and dice about 2.5 pounds of fruit. By the end, by knife needed to be resharpened, too. The pink color is re-enforced by the addition of cranberries--making the color a rosy red. 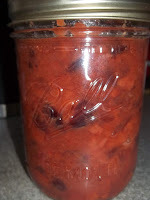 I didn't properly can/preserve the chutney, so it needs to be keep in the refrigerator till its is used up. One small jar will be shared with the QBG employee to showed me the tree, and gave me permission to harvest the fruit.